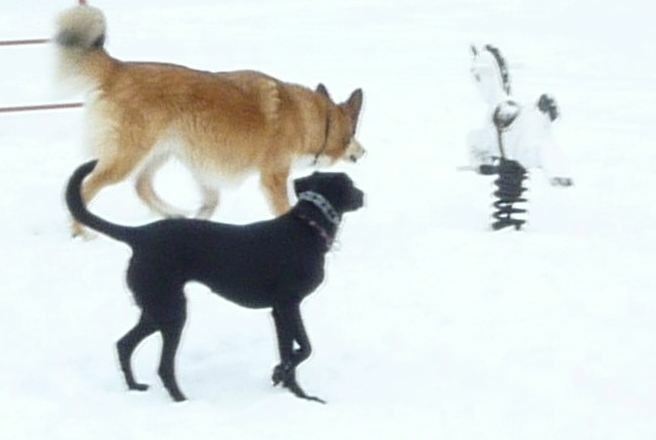 Charley (the yellow dog) and Brandi sneaking up on the scary riding horse at the playground. I just got back from walking my dog. We strolled all around the neighbourhood through the back lanes and Charley was really very good. A far cry from how he behaved when I first got him. I got Charley as a rescue dog from the pound. He had been seriously abused and he was so pathetic that I chose him even though I had really intended to get a much smaller and less hairy dog. But he was so scared he was shaking and it took four people to carry him to my car because I couldn’t even drag him there. 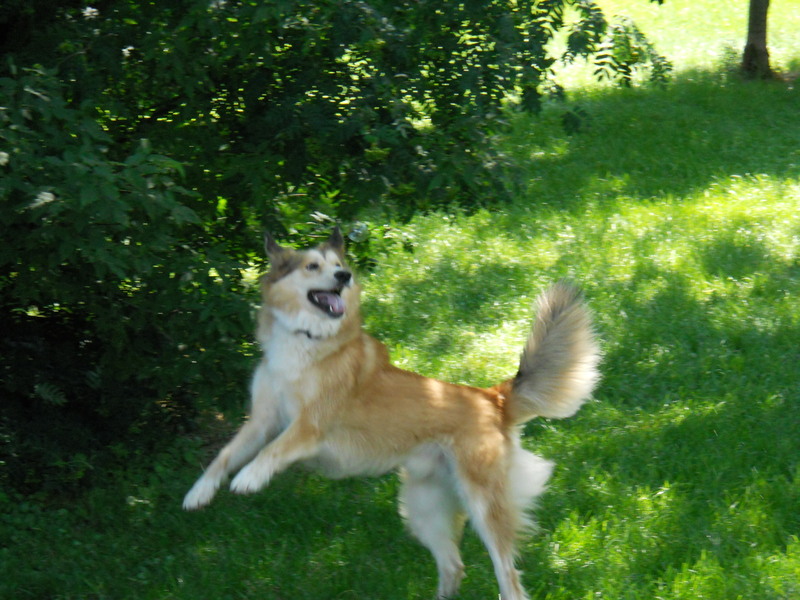 In retrospect I suspect it was a ploy to be adopted because as soon as we got home he was a happy and rambunctious dog. In fact, he explored the house and then jumped on my bed and literally jumped up and down in the middle of the bed with a big grin on his face. But he was still scared and aggressive with men and he was–still is, actually–terrible in the car. And he was very hard to walk. In fact, one day he knocked me down trying to chase a car on a busy street and dragged me along the sidewalk. Because I have two knee replacements, I can’t kneel and I had trouble getting up. When I finally wrestled him to the ground and got up, I was so mad that I walked him home with the leash so tight he was almost on tippy-toe. Then I got him a prong collar and he must have been trained on one because he was ecstatic when he saw it–and a perfectly behaved dog on every walk since. Charley now expects everyone to love him–and almost everyone does. Some small dogs attack him and usually take him by surprise because he expects to be friends with all dogs. Since I am planning to make a major life change and move, I expect to live in an apartment and I’m kind of puzzled as to how people handle dogs in an apartment. You obviously can’t just open the door and say, ‘Go pee’. So do people as soon as they wake up, throw a coat on over their jammies and take their dog for a walk, no matter what the weather? Do they do the same thing just before climbing into bed? It will definitely require a change of habits for me and some self-discipline. So I’ve started practicing. I’ve been taking Charley for a short walk every night just before bed and a short walk when I first get up. Okay so the short walk in the morning is the length of my backyard. I make a coffee and walk ‘my back forty’–the forty steps that takes me from the edge of my deck to my big Colorado blue spruce about half way down my property. It’s a start. I’ll build up to a real walk in a few weeks. I’m also walking Charley all around the neighbourhood every day right after work. Needless to say, he’s so happy to be getting so many walks. Dogs are creatures of habit and he’s quickly decided this is the routine, so as soon as I walk in the door he’s ready to go. And that will probably last for the rest of his life. My previous dog, a beautiful German Shepherd named Ruby, used to come to work with me every day. It was my business so I had that privilege. Ruby loved going to work and she was the greeter. Kids at the day care down the street used to come by and give Ruby treats. She loved that except when it was Hallowe’en because she was scared of the costumes. When I shut that business down and got a ‘real job’ and could no longer take Ruby to work, I couldn’t even say ‘work’ because she’d get excited and then disappointed. I sure do miss Ruby. If you’re a dog lover like me, you’re going to love the book I want to tell you about. I’m a joint venture partner on this new book launch and I can honestly say I’m proud to be part of this launch. It’s a book about a dog who used natural means to treat his own cancer. Here’s more information about this great little book. True story: dog fights cancer HIS way! You don’t have to have a pet (or know anyone with cancer) to be mesmerized by this amazing new book. But if you do, you’ll be even more captivated. 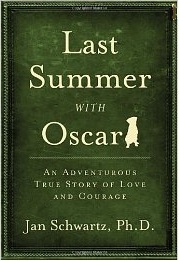 Last Summer with Oscar documents the author’s adventure with natural healing that began when her cancer-stricken dog Oscar started eating Slippery Elm leaves in the nearby woods – and month after month, defied his 60-day prognosis as she joined him in battling the cancer with natural remedies. Order this captivating book today during the official launch and you’ll get valuable free gifts worth much more than you’ll pay for the book! This book is compelling in so many ways: as a medical mystery story, a touching tale of love between a couple and their extraordinary pet, an exploration of natural healing, and a spiritual journey. There is something here for EVERY reader. • Peggy McColl’s audio presentation “The Greatest Life Lessons Dogs Teach Us About Living Rich.” (you don’t have to have a dog to benefit from the lessons)! Click this link to read more about the book and the free gifts that come with it during the launch. This is one of those deals you just don’t want to miss – not to mention a story you will never forget! Did you check the link? Doesn’t that look like a great book?